Rock climbers understand the importance of trust. Their life depends upon it. Climbers place trust in ropes, equipment, ability, but more importantly, climbers place trust in their team members, fellow climbers. J.D. Mosiman is a conceptual artist who prayerfully considers the materials he incorporates. For Trust the Seed he chose clay to represent humans, each uniquely formed by the artist from clay found on his property. 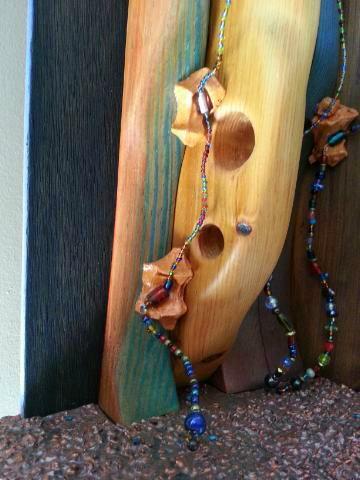 The beads symbolize relationships and containers in transition and transformation. The lower beads are opaque, shifting to transparent glass as they ascend through seasons and passages of life. The black beads contain things we hold onto. The piece is divided into lanes with a central avenue and an outer lane. Holes are provided as doors of opportunity for climbers to pass-through, allowing the outer climbers to join others in the center. Hidden in the top is a light, providing illumination, direction, and hope to the climbers. And just as there is a wideness in God’s mercy, the top is wider than the base. J.D. 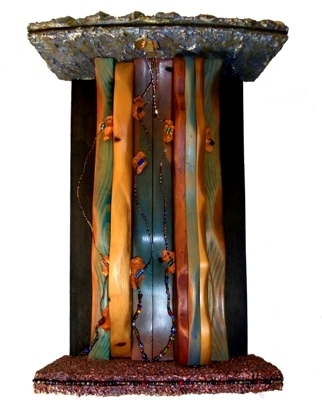 Mosiman: Trust the Seed, 2011, 18.5” x 24;5” x 8”, re-purposed wood, glass and metal beads, acrylic paint, drywall compound, LED, and clay from the artist’s property. J.D. Mosiman has owned and operated Elite Décor Painting and Decorating for 27 years, specializing in unique finishes and restoration techniques. See http://jdmosimanfineart.homestead.com/. Michael Carter has been involved in education for the last twenty years, from curriculum design and classroom teaching to speaking at national conferences. Currently Michael and his wife Teresa are managing partners of Art House Artisans: a studio devoted to teaching, training and mentoring individuals and offering seminars and workshops in group settings. See: http://fineartamerica.com/profiles/368-michael-carter.html.